Catalonia  (Catalan: Catalunya, Occitan: Catalonha, Spanish: Cataluña) is a nationality and autonomous community in the northeast of Spain. It borders France and Andorra to the north along the Pyrenees, the Mediterranean Sea to the east, Valencia to the south and Aragon to the west. Its capital is the famous city of Barcelona. Catalonia is an autonomous community within Iberia defined as a nationality, and before the 18th century it was an State (in the form of principality) of the Crown of Aragon, with a complex parlamentary system. Since 1714, as a consequence of its defeat in the War of the Spanish Succession, Catalan institutions and laws were supressed, as well as the administrative use of Catalan language. The country gained its current autonomous status first in the Republican era (1931-1939) and then again after Franco's death in 1975 and continues to press for more political and economic autonomy, mainly in the form of the right to decide on language, education, culture, healthcare and its political future. The main languages of Catalonia are Catalan, Spanish and Aranese (an Occitan dialect), and the three are official, but the Catalan is considered the one and main language by the Catalan laws. 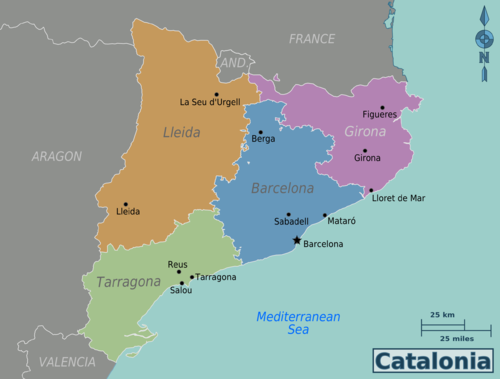 Catalan (Català) is spoken in Catalonia, Balearic Islands, most of Valencia region, a strip in Aragon, Andorra, Alguer-Alghero (little city of Sardinia - Italy) and, Roussillon (an area in the south of France sometimes called Catalunya Nord that corresponds roughly with the department of Pyrénées-Orientales). It is a Romance language and many words are recognizable to those who speak French, Italian, Spanish, Romanian or Portuguese. Locals really appreciate it if you try to say some words in Catalan while you are in Catalonia, and phrases such as "Bon dia" (Good morning) and "Adéu" (Goodbye) are heard even when people then go on to speak Castillian. Catalan is currently the first language of 35% of Catalonia's population (but is also the everyday language of 47%), and 93% of Catalans understand it. In rural areas Catalan is used almost exclusively, and while people there have no trouble with Spanish, they rarely use it except with outsiders. Visitors who speak Spanish should note that in Catalonia the term "castellano" (Catalan Castellà) is used rather than "español." Most people in Catalonia are bilingual in Catalan and Spanish, since they are required to learn both languages in school. Replying in Catalan to a question asked in Spanish is the polite way to inform the other party that the conversation may continue in Catalan if desired. If you do not speak Catalan, just politely say that you do not understand, and you will be without a problem in most cases. Spanish is the first language of 45% of Catalonia's population and 99% of Catalans speak the language fluently. The Occitan, called Aranese in the Catalan region of Aran Valley, is a minority language and only spoken by a couple of thousand people in this territory in northwest Catalonia, but is also official in whole Catalonia. Barcelona — it's worth the whole trip... has great food too! Santa Susanna - this well connected village is in-between the mountains of trees and the sea, the resort offers a variety of touristic services to ensure you have a pleasant stay. Santa Susanna is also close to the city of Barcelona (60 Km away), to Girona airport (35 Km) and Costa Brava region, so it has lots to offer you! Tossa de Mar - a lovely seaside resort, the real Costa Brava!! If you come around you must visit this! Barcelona's airport, called el Prat, is about 15 km to the city centre. Once there, you can go to the centre by train (every 30 minutes, stopping at Sants and Plaça de Catalunya), by bus (Aerobus), that stops in the same places and with the same frequencies. The bus is the more expensive option, with the added possibility of traffic jams. Both services finish at 23:00. Two local buses, EA (during the day) and EN (at night) also serve the airport, however these are not particularly frequent and only run as far as the Plaça d'Espanya, which is not particularly central. However, for those on a shoestring budget they may be a good option as they are fairly cheap. There is quite a good taxi service, the only way to reach the centre directly if you arrive by night. The fares are about €12 if you go to the centre, but this can change depending of the time of the day and, of course, the part of the city you want to reach. All Barcelona taxis are painted black and yellow and are easily recognisable. Of course, you can rent cars and there is a big car park, though it is quite expensive if you leave your car there for more than a couple of hours. Girona, in the girona region (in the northeastern part of Catalonia). There are now flights to this newly upgraded airport by Ryanair and British Airways. Travel by bus to Barcelona takes about 90 minutes and there is a bus service into Girona which costs about €15 round trip. The buses in Barcelona leave from Estacio del Nord bus station (metro stop Arc de Triomf, line 1). Reus,in the Tarragona region near Costa Daurada. The main train station in Barcelona is called Estació de Sants, but the most central ones are Plaça de Catalunya (most local and regional trains) and Passeig de Gràcia (serving some local and most long-distance lines). The Spanish train company is called RENFE . Barcelona is very well connected by train with Madrid, Valencia (City), Zaragoza and the Basque Country in particular and with the whole country in general. Inside Catalonia, there are frequent trains from the other three provincial capitals (Lleida, Tarragona and Girona). A few trains travel across the Pyrenees, but it's possible to reach the eastern part using the train to Tour de Carol (France). Going by train to the Costa Daurada beaches is the best choice, using the line to Tarragona. The Costa Brava isn't well connected by train. There's also a Catalan train company Ferrocarrils de la Generalitat de Catalunya  (FGC), which serves destinations near Barcelona, and some tourist routes. It also operates a funicular service in the Pyrenees. Buses and coaches connect the principal cities to many national and international locations, and it's the only public transport to get to many local places in Catalonia. The most important bus stations are: Estació de Sants (Barcelona), mainly for international routes, is next to the train station and very well connected. 'The Estació del Nord (also in Barcelona), close to Passeig de Sant Joan, is the main bus station for medium and long routes - the nearest metro (Line 1) and RENFE station is Arc de Triomf. The routes inside Catalonia are held by different companies, which leave from different places. Every town has normally only one company, so you should ask at some information point, or check online  which, although in Catalan, is quite easy to use (put the origin at the left, the destination at the right, and gives the name of the company and it's telephone number). See the volcanoes near the city of Olot, and La Fageda d'en Jordà, a very nice forest and extinct volcanoes. Catalonia has hundreds of "festes" that go on around the region every week of the year. The closest word in English to translate "Festa" would be "Festival" but this is inadequate to describe the type of celebration that exists in Catalonia. "Festes" are ritual like celebrations that have been passed down through generations of people for more than 700 years. They are organized by the people of a town for their own enjoyment, and not for any commercial interest. "Festival" (which also exists in the Catalan and Castilian languages) denotes an event that is usually organized by a specific group of people for a particular market, and is often motivated by economic interest. “Festes” have ritual like sequences of events that usually involve Giants, Devils, Human Castles and processions. A magical atmosphere is created at the “festa”, almost like a type of Catharsis. “Festes” stem from Medieval Times when fantastical dragons and Giants were created to instruct people about religion in church services. Shortly after the fantastical creatures became a part of the Corpus Christi processions that paraded through the town during the summer. The importance given to these folkloric elements has gradually increased over time and now they have assumed a national importance. Nowadays, these traditions are associated with Catalan identity as something that is individual and separate from the rest of Spain. These “festes” are not greatly publicized by the Catalan government for visitors. Because of its geographical location and terrific range of habitats, including dryland steppes, rocky coastlines, mountains and some of the most important wetland sites in Europe, Catalonia has a greater variety of bird life than anywhere else on the peninsular, with 95% of Iberia's and 50% of the whole Palearctic's recorded bird species. Some of the most sought-after are Lammergeier, Black Woodpecker, Wallcreeper, Bonelli's Eagle, Lesser Grey Shrike, Dupont's Lark (recognised as probably extinct in Catalonia in 2006), Little Bustard, Pin-tailed Sandgrouse, Audouin's Gull and Lesser Crested tern. The most important sites are Cap de Creus, Aiguamolls de L'Empordà, Barcelona's Llobregat Delta, the Parc de Garraf, Ebro Delta, Steppes of Lleida and, of course, The Pyrenees. There are a few companies that will organise tours for you, or even offer free advice, including Catalan Bird Tours and Oliva Rama Tours. There is also the Birdinginspain.com web site which offers birding sites and itineraries and lots of other useful information to help the visiting birder plan his or her trip to Catalonia. From Barcelona you can purchase a combined train ticket that can get you to the La Molina ski resort. There is also the option of taking a bus to Masella, another resort located very close to La Molina. There are lots of good places to eat. At lunch time (13-15:00 approx. ), a lot of Restaurants and Bars offer Menú del dia (Menu of the day - Prix Fixe), usually consisting of a choice of four starters, four main courses, wine and bread for a reasonable price. Some bars also offer "Plats Combinats" which are a few items served together at reasonable prices - eg Hamburger, egg and chips. At dinner time (20-23:00 approx), a Menú is not so frequent. In all the medium sized cities, you can expect to find a large range of possibilities. Paella - Typical rice dish from the Catalan Lands. Catalan paella is with seafood, while Valencian paella is without seafood. There's also a variant of paella which is made up with little noodles called "fideuà". In addition, paella and fideuà can be prepared with black squid ink, then it's called "fideuà negra" or "arròs negre" (black fideuà and black rice respectively). Bombas, Esqueixada, Cod Fritters, Escalivada, Suquet, Escudella, Cured Meats, Coca de Samfaina - are typical Catalan dishes found in traditional restaurants that represent the uniqueness of this Spanish region in terms of cuisine, which links back to 1477 when the first gastronomy book was written in Spain, exactly in Barcelona. Calçot - (Catalan pronunciation: [kəlˈsɔt]) is a type of scallion or green onion known as calçot in the Catalan language. Xanascat is the National Network of Youth Hostels  for all of Catalonia. They have 46 different installations throughout the region. The best option for low priced accommodations. Catalonia is usually a safe place. Be aware of pickpockets in crowds, and don't leave your car in the rest areas in motorways. Tourist areas such as Las Ramblas in Barcelona city attract many petty thieves, and you should be vigilant around these areas. As a tourist, you are a target for thieves. They can spot you and you cannot spot them. Do not carry all your money and documentation in the same bag or pocket. If you have been robbed, always go to the police. This page was last edited on 15 April 2019, at 08:38.